Art historian James Finch emailed me some excellent questions about my research using visitors’ conversations around Tino Sehgal’s These Associations. Having trained and worked as an artist, my own grasp of art history is (to mangle Barnett Newman) as a bird’s grasp of ornithology, so this exchange was useful for me in clarifying where (if at all) this research fits into an art historical account of the work. JF: Sehgal’s work rarely takes place in a setting such as Tate Modern, which has a balcony to look down on the piece (thus creating a participant/spectator dichotomy). A few months before the piece I remember Sehgal speaking at Tate Modern and saying how he was opposed to performance art because it depended on just this relationship which he saw as the product of historic class structures. So while the Tate piece undoubtedly offered the opportunity to observe the work from a distance, I think that it does so in a way anomalous in Sehgal’s practice. Of course, if hypothetically one was allowed to make a recording of the room where his piece was taking place, the conversations would be very different… Since the ‘spectators’ were not able to hear the conversations which make up such a large part of the work, to what extent are they ‘seeing’ the work….not at all, it seems to me. SA: You are absolutely right that these recordings were not made in a way that would try to emulate the experience of Sehgal’s piece. He was at pains to avoid creating that kind of artefact – both as a part of his practice and as a mediated by-product in newspapers, art magazines etc. I understand this as an additional narrative strategy in his work: extending the responsibility Sehgal takes for his work into how it is reported on and experienced through journalism and art mediation. So to capture how this work is experienced by visitors to the Tate it would be great if I could also listen in on how it is invoked in their everyday conversations outside the gallery context – at home, in the cafe etc. However, for practical purposes – the balcony is probably the closest I can come to that. Many of the people I recorded on the balcony had themselves been in the Hall, and had conversations with participants. In their conversations with each other, they bring this up as relevant to their analysis of the movement of people in the Hall – of the context etc. Similarly, they bring up past works in the Turbine Hall, and many other aspects of the location. Social class is also a theme that comes up frequently in people’s reading of the piece to each other – but not as a theoretical abstraction: they modify their accents when speaking to each other about it, or use different kinds of terms of reference ‘those London folk’ in a way that works to position themselves in relation to both the piece, and their interlocutors. In the conversations myself and other participants had with people in the Hall, less of that kind of relationship-work seemed to happen. Although Sehgal did try to maintain the spontaneity of conversation in the piece – the conceits we were taught to use to instigate those conversations, and the artificiality of the encounter mitigated against this kind of ‘ordinary’ work of relating to each other and the context being done. So in those semi-artifical conversations, spatial/social dichotomies between hall and balcony, and many other ‘assumed’ aspects of the gallery context became invisible in the talk. The major interactional problem being dealt with was the artificiality itself. JF: Recording people observing a Tino Sehgal piece is different from watching people watching a group of people walking around and talking, and I think that needs to be taken into consideration. SA: This is exactly the question that I’m interested in asking in as much detail as possible. How is it different – in which ways? Many of the people I’m recording have some knowledge of the piece, many do not and are encountering it ‘fresh’. It seems to me I have a data set uniquely relevant to answering this question. In order to explore this aspect of the piece without just speculating as to what makes it different, or just bucket-categorizing it as ‘gallery work’, this kind of data lets me ask that question in participants own terms. 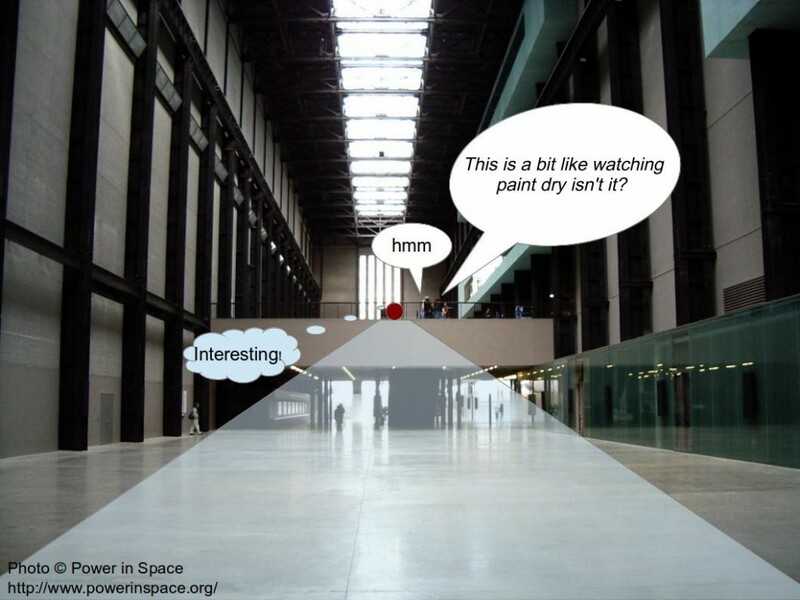 By analysing how the viewers invoke different aspects of the piece in conversations with one another: the spatial or art-historical context, how it looks and sounds, their shared or different analyses of it – I can focus on what they focus on, and see how they bring up the piece and use it in their everyday social interactions. JF: I realize now that my comment about there being an inside/outside dichotomy was perhaps simplistic, and your participation in the piece and that of many of those recorded shows the overlap. I think the data that you’ve assembled seems really significant, and probably unprecedented in work of this nature. It’s really exciting. SA: I don’t think your comment was simplistic. Having shown them some of my data, and heard their reactions, I think many of the other participants in the piece would agree with you – possibly Tino Sehgal would agree too, as certainly most of his work in the development of the piece focussed on people who would be directly involved in conversation. While workshopping the piece, learning and refining the flocking patterns, living tableaus and other group actions were often discussed in relation to how people would experience them either just before or just after a conversational encounter. What I’m excited about with this data is precisely the overlap you point out between first-time encounters and people who’ve been down and talked also between people who bring up foreknowledge of the place and the piece, and naive visitors. The way these kinds of distinctions are made visible and public by people through their interactions with one another in front of the work. It’s interesting to see how conventional art historical issues such as authorship, artistic intention, and aspects of the historical or cultural context come up in the most mundane descriptions or responses – and often with surprising sophistication. I guess the constraints of not being able to photograph or make videos of the piece itself make this kind of documentation seem particularly relevant or unusual. Actually the thing that surprises me is that nobody’s been interested in this detailed interpersonal view of an artwork’s social life before. JF: Just so you know where I’m coming from, I’m researching the art critic David Sylvester, who curated and wrote about Bacon, Magritte, Giacometti, Moore and many other artists. So my areas of interest are primarily aesthetics and art criticism, but I look out for anything on how the sciences can enrich those areas (which is how I came across your work), whether it’s using eye-scanners to record how people look at paintings, or any other ways of recording responses to artworks. SA: I didn’t know much about Sylvester but remembered reading some of his work then read some interviews and his Guardian obit. I like the sound of him. 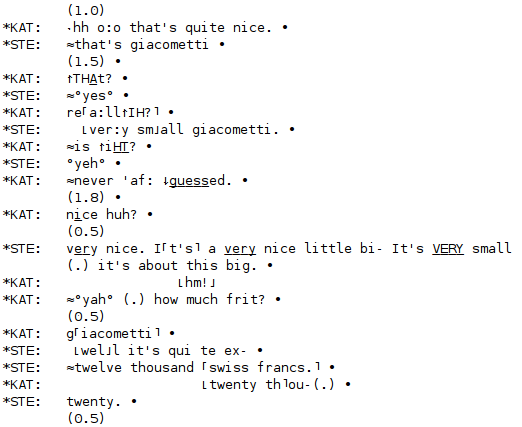 I thought you’d enjoy listening in on some conversations relating to artists he worked on – drawn from the Audio BNC – a large scale corpus of spoken natural language. These conversations were collected by several hundred people from different social demographics taping their everyday conversations in the early 90s. I transcribed this first extract from a conversation between Stefan (an art dealer) and Katherine (his client, I think) who are looking at an art catalogue together. 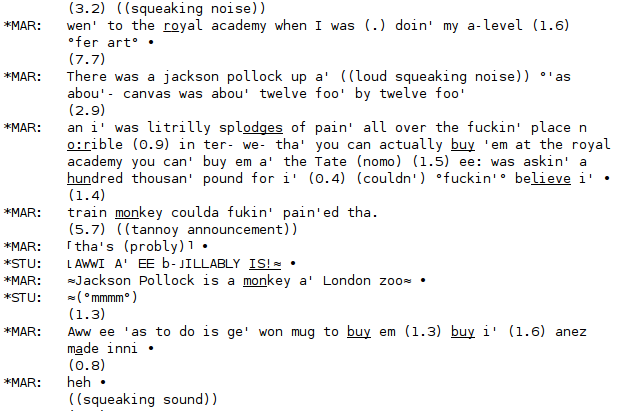 These are Jeffersonian transcriptions – they try to capture some aspects of overlap, gaps, timing of speech while still being readable. So here Mark and Stuart are in a very different context – perhaps the biggest difference here is that they’re not looking at an image they can both assess – Stuart’s access to the Pollock is only through Mark’s description. Also the way Mark brings it up seems to be built on the way that just prior to this extract, when Mark brings up what he saw at the Royal Academy as a potential topic for conversation, Stuart says he’s ‘not an arty person’ and that the last time he went to a ‘place like that’ was at school. But again, money talk seems central. JF: Perhaps it’s a shortcoming on my part to think about the artist before the audience, but I take it as axiomatic that if the area of study is an artwork, then it is necessarily a constructed and artificial situation. In response to the question of how the Sehgal piece is different from watching people walking and talking, for me that is the difference (one is an artwork and the other isn’t- it might seem like a cop-out but for nearly a hundred years that’s been as close as we get). much of a bearing on an art historical account of these artists’ work. Nonetheless I’m struck – looking through many conversations like this – how the vernacular concerns of art appreciation in different mundane contexts intersect with (and perhaps give lie to) critical/theoretical axioms. For example the stylistic coherence of a Giacommetti (or its characteristic departure from a kind of figurative naturalism) seems implicitly at issue for Katherine and Stefan – but seemingly in the service of a kind of competition as to which of them comes off as more knowledgeable. So this is clearly different from the way critics might write a text focussing on the development or peer influences on that style – although I wouldn’t be surprised if similar kinds of one-upmanship were evident in that context too – especially face-to-face. The way that Mark and Stuart also talk about scale and formal properties of Pollock in relation to its price, also in the service of developing something about their relationship with each other (their affiliation as critics of abstraction?) suggests to me some basic affinity between vernacular and art-critical practices of aesthetic appreciation and development. JF: This is a conceptual difference rather than a formal one, so clearly some visitors to the gallery won’t be aware of this and will be encountering the work ‘fresh’. But any resultant confusion is largely the product of deliberate decisions by Sehgal and the Tate (the bare minimum of information about the event, for instance). Sehgal doesn’t draw attention to his works, and thereby he deliberately creates ambiguity (which I can imagine is reflected in some of the conversations). As I understand it your research is directed towards audience response to ‘These Associations’, rather than an analysis of the piece itself. My questions at this point are: Why did you choose this piece to research? Is it because that participant-observer boundary is so blurred? SA: Yes, I agree that Sehgal and the Tate are working with these distinctions as a part of their material – ambiguity as an artistic strategy. However, what I’m seeing from the conversations (both at the Tate and in the British National Corpus) is that people are constantly dealing with the ambiguity of conceptual and formal properties of a work. Just the basic work of framing something as an artwork in the conversation before any assessment can be made of it – requires Mark and Stuart to deal with both formal and institutional/contextual issues. Then the fact that Stuart’s only access to the work is through Mark’s description of it makes the question of formal vs. conceptual even more problematic. Whether the artwork is right in front of the people talking or invoked as an object of discussion in other contexts. What I’m seeing in this kind of everyday aesthetics is a constant interplay between reporting objectively accessible properties of the artwork (formal characteristics, prices, artist attributions) and relatively subjective, privately accessible ones (context of viewing, assessments of beauty, personal associations). If this ambiguity is always there in talk about paintings and sculptures, then how much more so, as you point out, for a piece like These Associations where its status as an artwork and its boundaries are intentionally unclear. So I chose These Associations because listening to people deal with its ambiguity is revealing about how the piece is formulated as an artwork through people discovering and discussing it. I’m also finding that this process is really interesting for the study of language and interaction itself. There are not so many contexts where people are able to talk to each other while dealing with the basic intelligibility of something – where cultural knowledge, biographical account and sensory experience and interpretation intersect and can be recorded in the wild. JF: How much are the conversations specific not just to this piece but to the Tate itself? I’m interested not just by how different conversations relating to this piece would be from others by Sehgal or other ‘participatory artists, but the role that the architecture of the Tate plays in your research. I’m not talking about something as vague as ‘gallery context’, but something very specific to the Tate: I can think of very few galleries where you can remove yourself from a work but observe it from a distance in this way, so that it is still ‘present’ while you reflect upon it. You say that : “it would be great if I could also listen in on how it is invoked in their everyday conversations outside the gallery context – at home, in the cafe etc. However, for practical purposes – the balcony is probably the closest I can come to that.” but I would consider this from the other direction and see the balcony not just as the closest you can get to the everyday, but a structure specific to the Tate. You have recorded simultaneous presence and absence of the work, if that makes sense, which you could hardly do anywhere else. Stuart’s conversations are to the building site, and Katherine’s and Stefan’s to the gallery office… In some ways that’s a limitation of this method, that I can only talk about one conversation without necessarily generalising by labelling them as distinctly being ‘about These Associations’ or giving them some other analytical category. That is also a strength of the method – because it’s only through their situated social actions (for example, and to simplify grossly: competing about art knowledge – in Stefan and Katherine’s case, or affiliating with one another – in Mark and Stuart’s) that things like the artwork or the gallery are invoked as relevant and empirically accessible for analysis at all. JF: This leads me on to another tangential thought, which is probably outside your purview: thinking about my own experience of being in the Turbine Hall, I’ve always been very aware that I can be watched from above while moving around in the space. I’m not sure I’ve mentioned it to anyone before (we’re always being watched, etc), but it always factors into my experience. I mention this just as an example of the sort of experiential factor which might not turn up in the conversations (although perhaps it does) but seems to me very much part of the work. I’m just musing (and certainly not suggesting you should be able to mind-read! ), because with projects involving the sciences and visual arts I’m always thinking about the potential blindspots. SA: Interesting thought – actually it does show up to some extent: I get a lot of talk from the watchers themselves. I also have talk from over-hearers: peopl reporting on what they’re hearing other people saying (often about othe people or the piece). As for people being overheard: people often lower their voices at certain points in their conversations – as the balcony was often crowded and it was hard not to be overheard so you could hear people dealing with that aspect of the situation, although annoyingly, not what they were saying while they hush their voices, although you can learn a lot from what they say just before and just after they hush. People who have been in conversations with Sehgal’s participants also often report on what they thought or how they felt at the time – so you get access to this through how it’s reported to an interlocutor as a story. Not quite mind-reading, but still analytically useful to see how these issues get used in conversation. JF: And one final thought about Sehgal’s work in general (and again not necessarily relevant here but your email triggered the thought- any ‘artificiality’ I consider not a problem to be overcome (as it would be in everyday conversation) but something pretty much inevitable in some degree which he either plays up or down. The Tate piece is pretty ‘naturalistic’ within his work- examples of the more purposefully artificial are the Turner Prize piece where you essentially get paid for having a conversation, and the earlier Frieze art fair piece where (if I remember rightly) a child manning a commercial gallery booth came up to you and talked about collecting. SA: I completely agree – I’m very interested in that, although I have to admit to knowing very little about art history apart from the relatively thin slice of it that I’ve been exposed to through more practical training at art school. So I really don’t know how to communicate that impact – or how it factors into a broader art historical debate. How do people make sense of Tuner Prize nominee Tino Sehgal’s These Associations? And what can cognitive scientists learn from the way they do it? The result of the Turner prize 2013 has been reported worldwide as a shock win – mostly because this year, the chosen artwork is less shocking than usual. French artist Laure Prouvost’s madcap films overturned both critical expectations and the bookie’s 6/1 odds against her to win. While William Hill and Ladbrokes had David Shrigley’s mischievous peeing sculptures as a 2/1 favourite, the critics had fancied Tino Sehgal’s live conceptual/performance artworks. The Turner prize and its contestants have become famous for creating controversy and public discussion about the limits of what artists, galleries and critics consider worthy of aesthetic judgement. However, new research from Queen Mary University of London’s Cognitive Science Group suggests that audiences are generally unfazed by this kind of issue. In ordinary conversations between visitors to the Tate Modern, one of the most supposedly ‘experimental’ artworks in this year’s Turner Prize was immediately and unproblematically subjected to complex processes of aesthetic judgement by the viewing public. 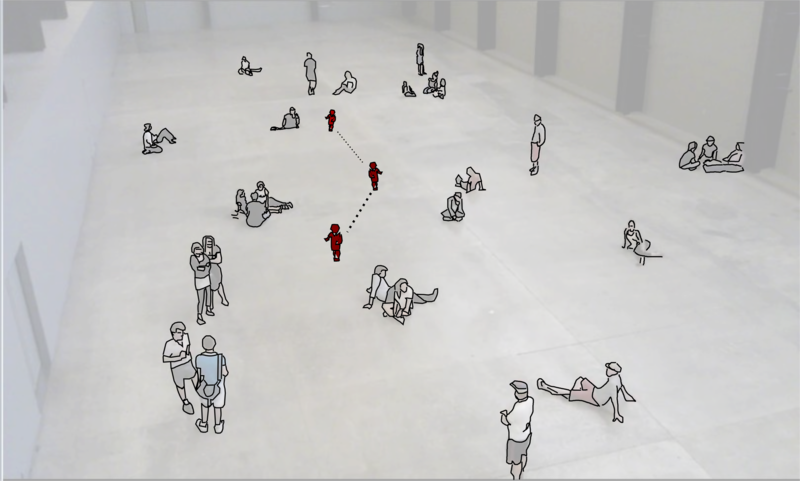 To find out how (and if) people made sense of Tino Sehgal’s Turner Prize-nominated artwork These Associations, I recorded and analysed over two hundred ordinary conversations between visitors to the Tate Modern’s Turbine Hall. I collected recordings of visitors’ conversations over the duration of Sehgal’s performance piece for which the artist trained 300 participants (including the researcher himself) to engage in a series of coordinated movements on the floor of the 3400m² Turbine Hall. Throughout gallery opening hours in the summer of 2012, up to 70 of these participants at a time would blend into the crowds of tourists, gallery-goers and school children that usually fill the hall. Sometimes Sehgal’s participants would engage visitors in one-to-one conversations, at others they would break out into songs or chants, run in a flocking pattern, or slow-walk through the hall as a large group. For the visitors on the balcony overlooking the hall, this was quite a spectacle, and they would often stand in couples or small groups talking and watching. Although the But is it art? question is always in the headlines when the Turner Prize is announced, visitors to the Turbine Hall seemed not to care one way or the other. While the question was frequently invoked, and many guests simply assumed that what they were witnessing was an unauthorized and spontaneous ‘flashmob’, most conversations quickly moved on to discussing and describing the action unfolding in front of them—more like sports commentary or a nature documentary voice-over than art criticism. People’s commentaries were often funny, insightful and playful. “Standing… Standing’s really contemporary right now” was a young American woman’s description of one of Sehgal’s living tableau scenes. “A bit like watching paint dry isn’t it” was one older English woman’s assessment, although she and her friend then discussed what they were observing in detail for half an hour. Several groups of children also learned to play ‘Pooh sticks’ with the piece: as Sehgal’s participants marched under the viewing bridge, they would pick favourites and then run to see whose would walk out first on the other side. Even negative assessments of the work were then justified in discussion of the details of the piece: how it worked, what it looked like, who the trained participants were and how to tell them apart from ordinary gallery visitors, and what underlying rationale might account for different patterns, behaviours or movements. Many visitors who arrived on the balcony talking to each other would lapse into long comfortable silences (quite unusual in normal conversation), while others would make ‘oohing’ and ‘aahing’ noises like people watching firework displays. However, both noisy and silent watchers would then explain their reactions to each other in terms of their analysis of the piece. Most striking was how people would seamlessly switch between talking about the artwork and talking about other aspects of their lives: work, music, London, the events of their day, etc., then back to the piece. Often assessments of the artwork were bound up in practical issues about whether to move on or stay watching, what to eat for lunch or what to view next. The initial findings of this research suggest that seeing something as art—whether good or bad—is an ordinary, everyday social activity. Aesthetic judgements of Sehgal’s work did not come out as individual’s lofty ‘judgements of taste’, but were embedded in people’s everyday social activities. So the humour and skill with which people explained what they were experiencing to one another other was central to their enjoyment of Sehgal’s work – whether or not they categorized it as art. The study of aesthetics in psychology, neuroscience and artificial intelligence has tended to concentrate on how people’s reactions to formal properties of traditional artistic objects or images, on survey data, or on tests of people’s basic perceptual or cognitive capabilities. These approaches tend to avoid dealing with artworks which—like many that are nominated for the Turner Prize – use non-conventional art forms because they may not be perceived ‘correctly’ as art outside of a gallery context. But by looking at how people spontaneously explain their own perceptions of new and unfamiliar art forms to each other while in the process of experiencing them, this research explores how judgements of taste constantly adapt to changing social contexts. Finding out how interaction shapes the contexts in which aesthetic judgements ordinarily happen may be key to a more general understanding of how human cognition and perception adapt to constantly changing social situations and norms.